Gift Wrapping Tips & Tricks - Hej Doll | Simple modern living by Jessica Doll. With the holidays in full swing, I thought it would be nice to share some of my favorite gift wrapping tips and tricks. I always prefer to remain on the simple side when it comes to holiday gift wrapping. Most of the time wrapping is tossed to the side after a gift is received anyway and I’d rather not be too wasteful. Do you have wrap from another gift? Packaging materials in something you ordered online? One year we wrapped all of our Christmas gifts with kraft packing paper from Amazon orders. It felt nice to not let the paper go to waste. This year I’m using some white photo backdrop paper from part of a roll that is too short to use in my studio. Sometimes I save ribbons and twine that I like from other gifts or packing in a special box to reuse later (My toddler just loves to get into it). I also like to repurpose things like baskets and containers that I no longer need or use in my home (but are still in great condition) to make gift baskets. For a clean and non-distracting look, I like to use plain paper. It can range anywhere from plain white paper, to kraft, to paper with a single color or texture. I find that it takes a gift to a new level and keeps the focus on the actual gift instead of the wrap. With baskets you can use a plain cloth napkin, scarf, or plain tissue paper. I learned this trick a few years ago, to tie a ribbon around a gift so that it can be opened with one pull of a string. It’s not as hard as it sounds, and even wastes less ribbon in the process since you don’t trim it until you’ve tied your bow. Find the steps below. Lay your ribbon across your gift with the cut side on the left, making sure there is enough of the ribbon from the center to make one half of the bow. This length will vary based on your bow size, and ribbon thickness. Wrap the right side of your ribbon around the back of your gift, around the left side and back to center again. Fold ribbon upward at a 90 degree angle. While holding your ribbon on the fold you just made in the center, wrap it up over the top, down the back, and up under the bottom of the gift. Hook it through the upper left side ribbon and bring it back down to the right. Move your left loose ribbon under the horizontal wrap. Take your left side ribbon and fold it up to start to tie your bow. Complete your bow tie and trim excess where needed. Ta-da! You’re all set. Now to open the gift, someone only needs to pull one side of the bow and it will come off without a struggle. Although there are some cute ones out there, I prefer to just write on my gifts. Makes my wrapping job a lot easier, and I can get creative if I’d like. If you want to get really creative, you can even snag a photo of the recipient to print a small version of to attach to the gift. After you have your gift wrapped, you can add simple details to make it look a little more fancy. On this gift I added some rosemary from my yard, but you can add any found object if you’d like. You can even add a small trinket. On another gift from this year I’ve included a handmade ornament as a keepsake. If you want to go crazy with your pen you can decorate the wrap or add your own design. You can even switch out your regular tape for washi tape. 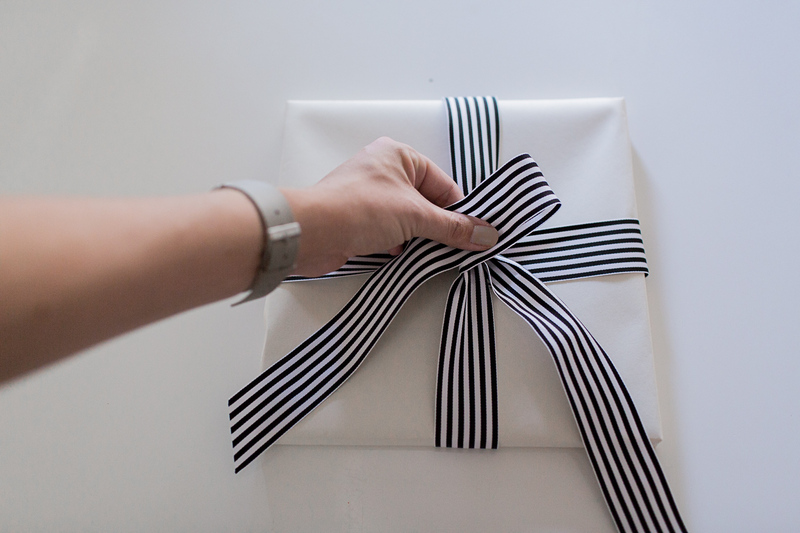 Do you have any favorite gift wrapping tips or tricks? I’d love to hear! I am the worlds worst gift wrapper. My parents and friends laugh at my gift wrapping attempts every year! You make it look so easy. I think that’s my favorite too. It smells SO nice. This is such a good idea! I love how fresh looking, and simple it is, and it saves money! Great tips you share on this blog. I am glad to find it. Really i am happy with your blog. Thanks a lot for this beauty Enjoying article with me. I appreciate it very much!